It’s Monday and we are off to an early start today with 6:00am wake up times from both boys, but I guess they are just ready to get this week going. We had a pretty laid back weekend, which we definitely welcomed with open arms. I think our weekend calendar is booked straight through to July from here on out. We have birthday parties, I’m hosting a party, both sets of grandparents coming in, baby showers, bridal shower, a wedding, a family vacation, a 5k run, a 10k run, Mother’s Day, Father’s Day. At least we are looking forward to all these celebrations and events, it’s just going to be non-stop right into Summer! Friday was a fun day with the boys. It was beautiful out so we spent most of the day playing outside. 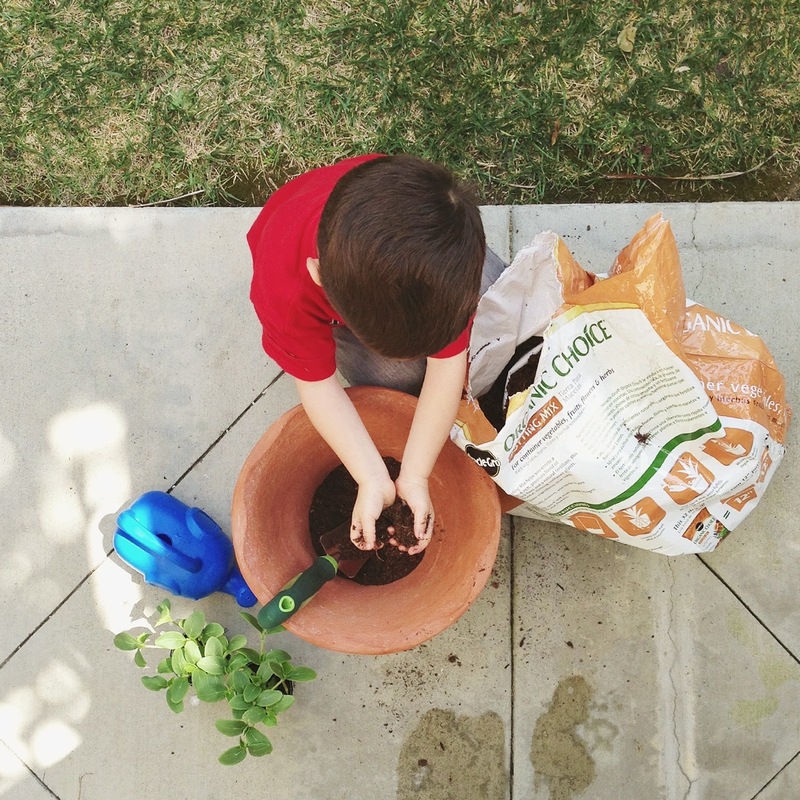 We ran a few errands, came home, and then Nathan and I spent time gardening together while Shane took a long nap. We added mint, sweet basil, cucumbers and snapdragon flowers to our garden. So far (knock on wood) all our plants are thriving, and I’m looking forward to our first harvest of tomatoes, kumquats, cucumbers and strawberries! Friday night Greg had a firepit and guitar night with some of his friends in the driveway, and I went down the street for a girls’ night in. We had a really fun time all catching up and drinking chugging wine! I somehow woke up and ran out the door to make it to my 7:30am Saturday morning Turbo Kickboxing class. After class Greg took Nathan to his swim lesson, and I got ready while Shane took a welcomed morning nap. I drove into Newport Beach for my friend Kate’s Sprinkle. 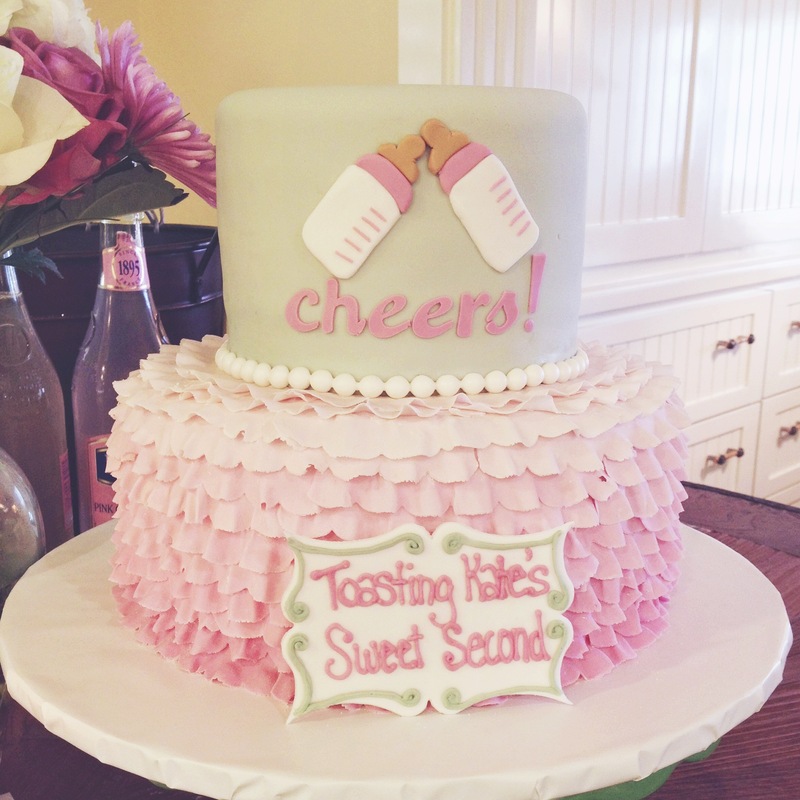 She is having her second baby girl in June, and her friends threw her the nicest shower. I’m still thinking of the amazing food, cake, champagne and treats they served! Would you look at this cake? OBSESSED. Came home and had a relaxing evening with the boys. We watched The Lion King and got Chipotle to-go. I’m pretty sure we all fell asleep before 10:00 for once. It was a perfect end to the day! Sunday we woke up early and got ready to meet our neighbors for our weekend run. The guys did a great 5 mile loop, and the ladies did a hilly 4.5 miles. Everyone is picking up their pace and their distance, and now we are going to start focusing on steeper elevations. The 10k Camp Pendalton mud run is 8 weeks away and from what I’ve been told the first 3 miles is all uphill. I was also told they added a hay bail obstacle as well as a net climb. This is just sounding more and more daunting by the minute. In less than a month I am doing the 5k Color Run with 3 of my girlfriends. This run is totally just to have a messy good time that goes to a good cause! Everyone starts off wearing white, and by the end you are a rainbow of colored pigment dust. 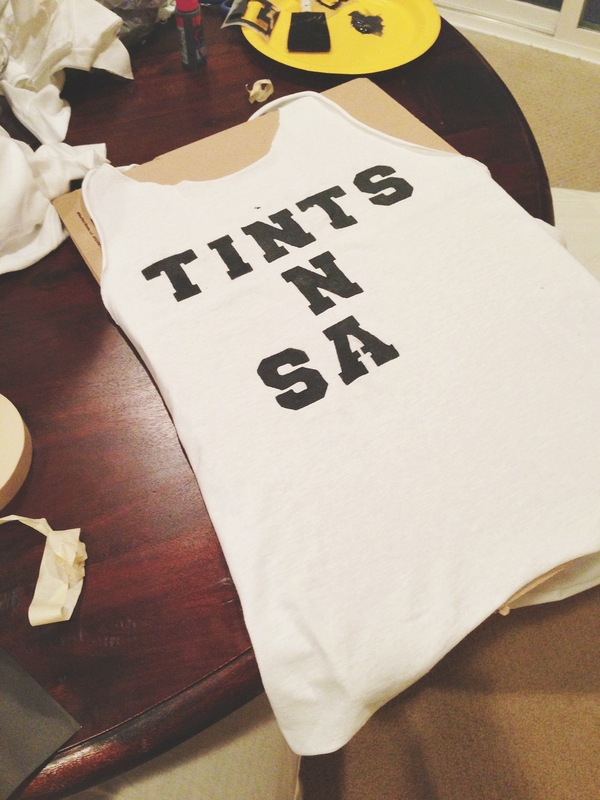 I started working on our team shirts yesterday. 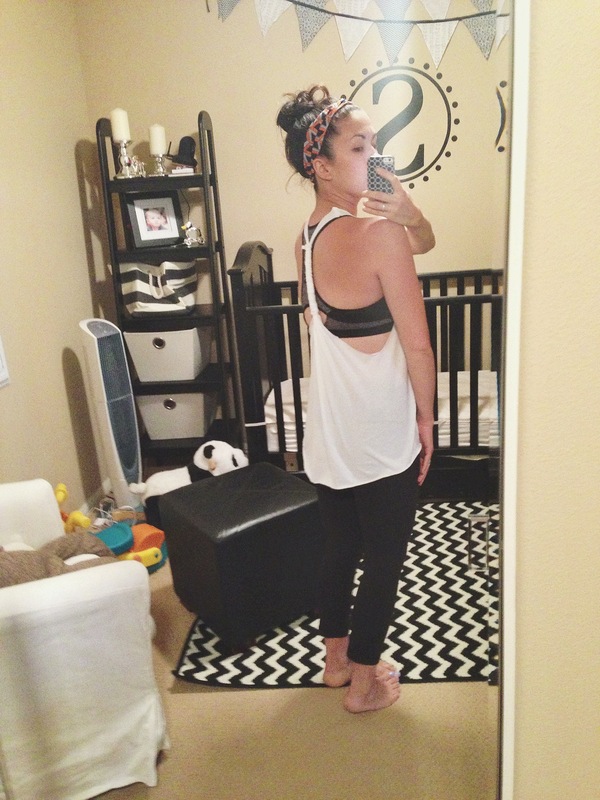 I found this awesome tutorial on a DIY workout shirt and thought I would give it a try. The cutting out of the shirt was the easy part. The stenciling of our team name hasn’t been quite as simple. Here is how they turned out though. 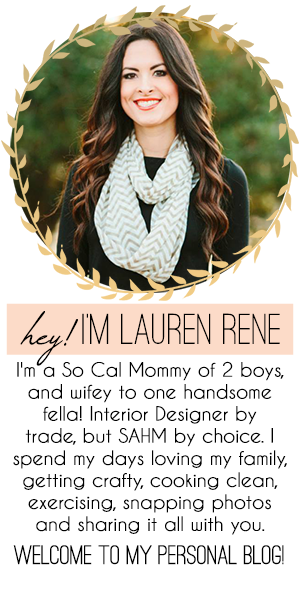 I think they are pretty cute, and our team name stills makes me giggle! That’s all I have to report from this weekend. I hope you all had a great one as well. Got my Monday Meal Plan all written down, now I just need Shane to take a nap so we can get ready and tackle the grocery store this afternoon. Stay tuned for this week’s recipe line up! Happy Monday!! I love that this is a laid-back weekend for you – we would totally be friends (and continue to drive my husband crazy). Love the tshirts and what fun… you’re really getting into all the running and races! SO good for you. Do the boys ride in a double-stroller or something while you’re running? Ha I guess it didn’t sound too “laid-back” now that I think about it, but it sure felt that way! It’s like if you have more than an hour of downtime on the weekends it feels relaxing lol. As for running…we sometimes run with a double stroller during the evenings so Greg and I can run together. Usually we run separate of each other though because it’s easier than trying to get the kids to cooperate. For the races though we will definitely be running without a stroller/kids! What kind of double stroller are you looking into? I really wish we got a BOB! Fortunately our neighbors let us borrow theirs anytime we want. Hahah I love it Saz!!! And I love that you guys are doing a color run too! I can’t wait to see photos of you two, love that you are doing it together! 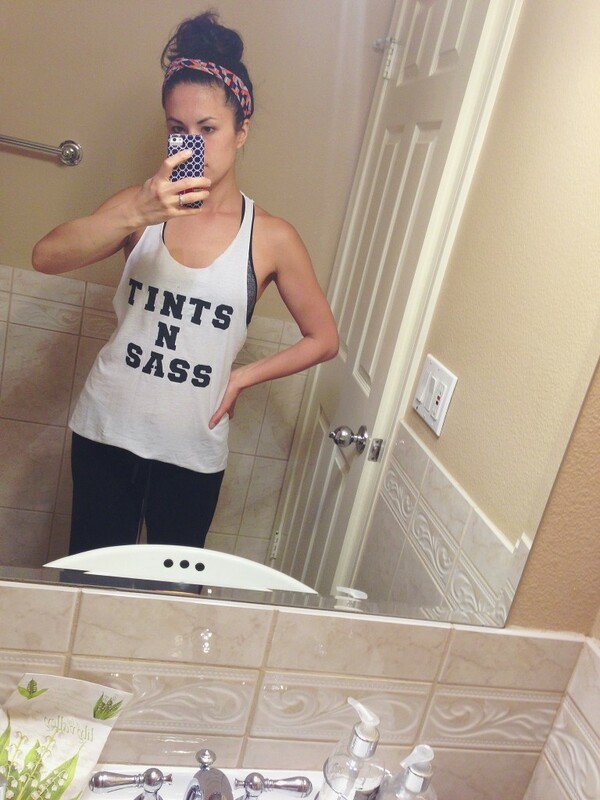 Tints n Sass is probably the best name ever! How in the world you could drink wine then get up for an early am turbo kickboxing class is something so beyond my capabilities. That is the most impressive thing I have ever heard! I love late night wine sipping… almost as much as I love going to bed by 10 Sounds like an awesome, busy weekend! Ha glad you thought our name was funny too! Hope it’s not too inappropriate lol. I have no idea how I go to the gym after drinking, my friend and I actually keep saying our best runs have been while we are hungover. Doesn’t seem right haha. Love your shirt! Our Color Run is in May, hooray! We are making tutus. Who watches the boys when you go on runs? Do you bring them with you? Omg Liz I’m in love with that couple’s shirt idea!! So hilarious! You and Saz are making me want to do a race with Greg, but yeah…the whole watching the boys thing is tough. There is a Disneyland run (will have to wait until next year) but maybe we should just do that one together WITH the heavy boys in a stroller haha.